Doesnt anybody realise that it's a death trap, and yet everybody is lining up? The best anybody could have done is stay behind one of the scrap metal and use it as a shield!!! OK, so before we get into the heat of the battle, we better have a seat and discuss how we go about it first. Parents teaching their child who went in the wrong direction. Edited by RoneMok, 13 February 2015 - 07:43 PM. 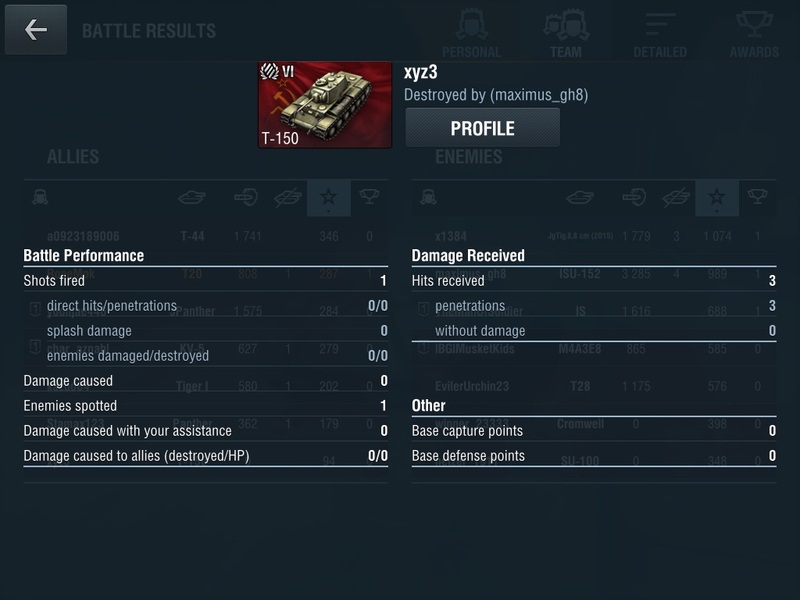 Sigh, I had a crusader trolling and blocking our advance which had me (IS), a KV-1 and T-150. He didn't stop until I told the others to traverse right and I shot him! He then went to camp! Amazed with the noobs and trollers we have these days! Wishing everybody a happy prosperous lunar new year. Stay always healthy and wealthy, happy and young. Thanks - Happy New Year to you too. After 6,000 games, and a WR of 48.50%, I tried to platoon. Till date, I have 60 platoon games with about 10 different mates. OK, call me a dirty old man if you want... But it's all for the survey, you know... For the good of all. The results are good. The WR inches upwards. But not as fast as I expected. I should have tried Viag**. 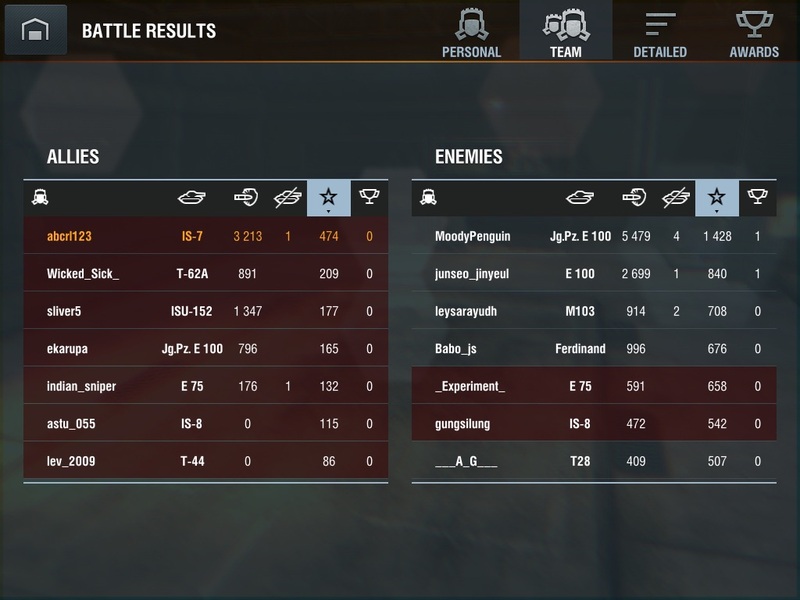 The chances of a win in a platoon game increases by about 20%, if the other platoon mate is good (above 50% WR). This doesnt include the platoon mate or myself getting destroyed, only talking about a victory. The different platmates have vastly different play styles, different preferences to different tanks and the tiers. It's really stimulating to play with these platmates. My horizon really expands when I play with them... So many combinations. A few play like gangsters, yolo away and at the front line with me. Others play like a gentle lady, waiting patiently at home, waiting for me to bring back the trophy but still contributing so much sniping away with so many kills, even achieving highest kills sometimes. And still others use themselves to lure the enemies to the hunters' guns. The downside I feel is the peer pressure with the platmates. I always have these imaginary eyes looking at me. 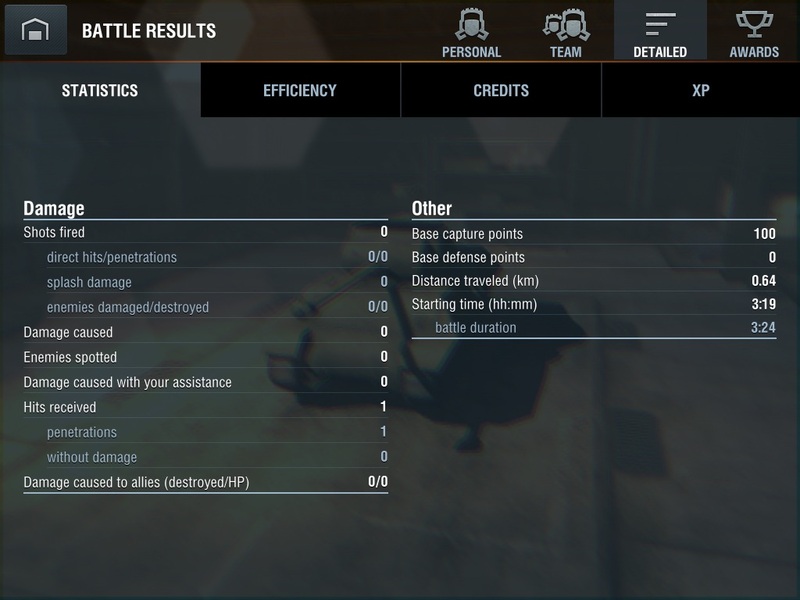 How I move my tank, the direction I take, the damage I deal and the damage I get. The worst is when I get destroyed and the platmate is still going strong in its HP. My only consolation in a platoon is when I get a higher position than the platmate. Nowadays, I get so many more platoon invitations when my WR is higher and players platoon with me before. I guess words passed around by word of mouth. But still, I think I may not be platooning much if I want to really enjoy the games. Nothing can hurt me, insults or even defeats... But Peer pressure can crack my soul. Edited by RoneMok, 20 February 2015 - 09:41 AM. A gentle lady? Interesting metaphor - are you playing World of Pride & Predjudice Blitz...? Platoons are great and i highly recommend you do them as much as possible. Its great banter, and great WR. Aegon and I had 12W-1L this morning - whats not to like! Dont worry about your platmates judging you. 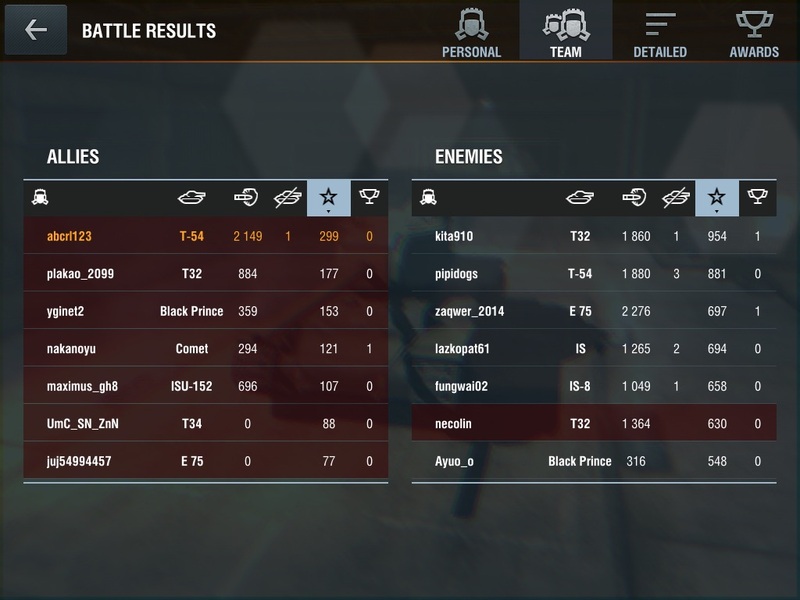 Just enjoy your platoon, and apologise & improve if you mess up. However hard you may feel judged by a poor display, it can't be worse than Ras stealing from Dix - my worst faux par in Blitz. He didnt make a fuss and he still platoons with me, so good platoon buddies will forgive your mistakes, so try to relax and enjoy the game. Haha... Gentle lady is just a description, comparing with the other types of play style. She doesnt jostle around with the enemy. She stays aloof and away from the maddening crowd. Since you stay in asia so long.... Ever seen a gentle lady turn into a tiger when spurned? This is the type I was referring to. Yes, I will take your advice and platoon more. Oh, poor Dix, you should have been more circumspect and cordon off the area for him to harvest the RAS. And so I get this again. I cant undrstd!!! Really need more short cut commands buttons. 3 of our team mates are nearly dead anyway... Furthermore we are the lower tiers. New US branch, new US tanks. Have to buy slots soon, cos I am running out of space in the garage!!! I have more than a hundred friends on WOT. Every time I think to chat with my friends, I shiver with the ordeal. I have sent in a ticket for the active ones to remain at the top more than 2 weeks already. WOT has yet to answer or remedy the programming. 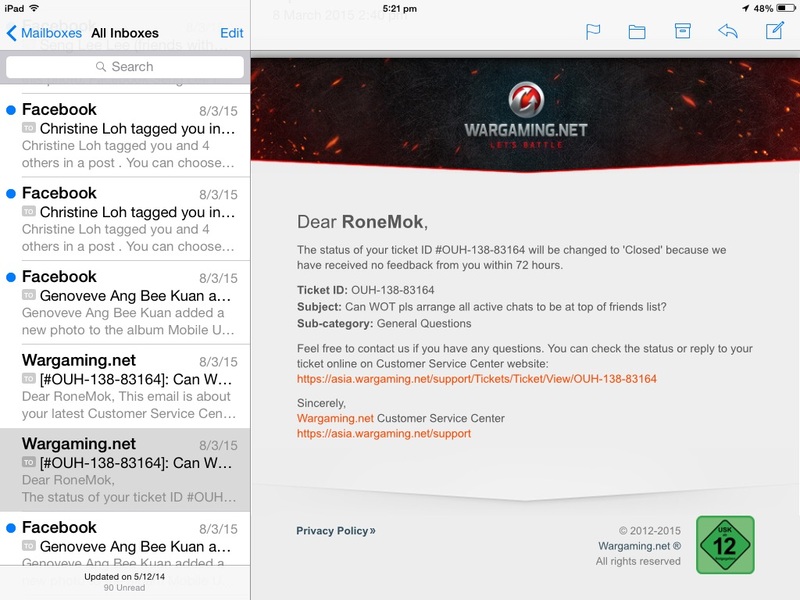 Why WOT keep closing my ticket without any real solutions? Are they that busy? Maybe busy selling products and services? And no after sales service? I really wonder cos I ever asked about how to put up a picture in my profile but also closed ticket about late last year. In the end, I had to pay somebody to help me. Edited by RoneMok, 16 March 2015 - 09:27 AM. S/he would rather jump in than to give in... Brave warrior. Edited by RoneMok, 15 March 2015 - 06:06 AM. Just take a look yourself. You can think of anything. I have no comments, cos I dont want to cause this post to be taken down. Some things are worth sharing. Well i had a few of these games too. Guess they could be bots or just playing for fun. Don't feel bad. It's just one of those days. See this screenshot. That's the luck of the draw sadly. The main guy I plat with is probably more the "gentle lady" type, so I don't feel judged at all, would actually like to play with someone else just to see another style of player. In regards to campers/trolls/afk/bots blah blah, as always, never underestimate the predictability of stupidity. Words to live by. Two fish in a tank, one says " you drive and I'll man the gun!" ^^ What the h*** is a "gentle lady" type??! And does your plat mate read the forums??! Lol. Edited by axolotlrose, 15 March 2015 - 02:07 PM. read further up, ronemok started it. No, it wasn't too much of an insult anyway, he just doesn't push that much is all.